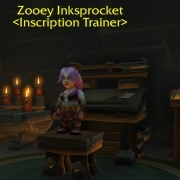 We’ve moved through the part where we learn to make glyphs, and now we move to the Complicated Part where we need the assistance of Trade Skill Master addon. WARNING: IMAGE INTENSIVE POST. Click image for larger image with greater detail. Important images are already blown up full size. TSM is used simply to automate, to make easy and quicker, that which we could do on our own. So in order to give the commands to TSM, we need to work out what commands to give. Once the numbers are set up, you have made huge steps towards a Passive Income. After you are certain you have TSM installed, open your Professions window and click Inscription. 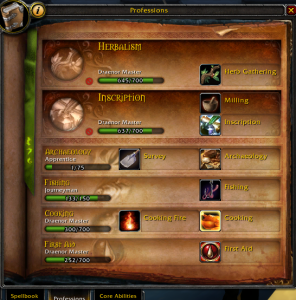 Instead of your usual professions window, TSM will politely ask you whether you would like it to automatically generate/create groups based on your profession of Inscription. Open TSM with the /TSM command. 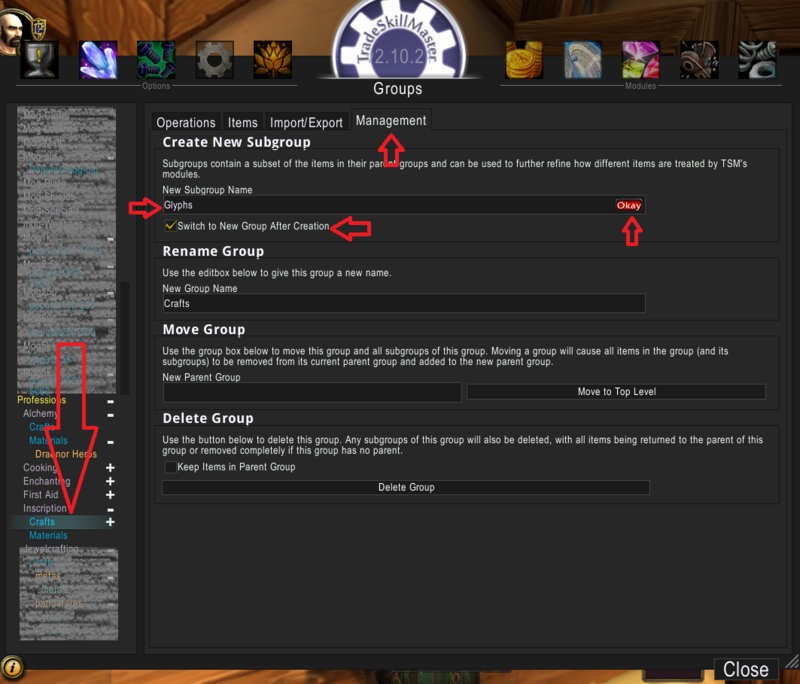 Choose “Groups” , which is the blue crystal at the top left. Open TSM with the /TSM command. 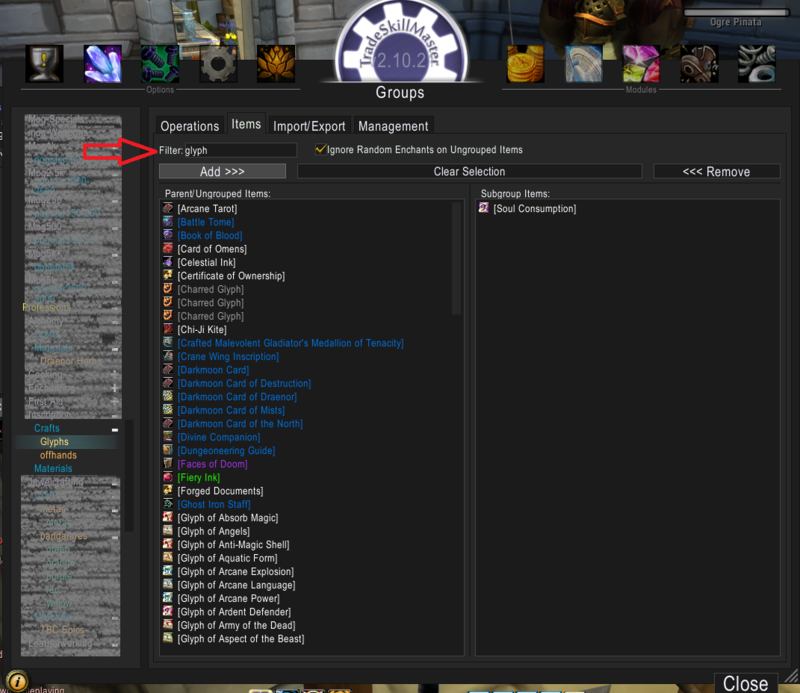 Choose “Groups” , which is the blue crystal at the top left. 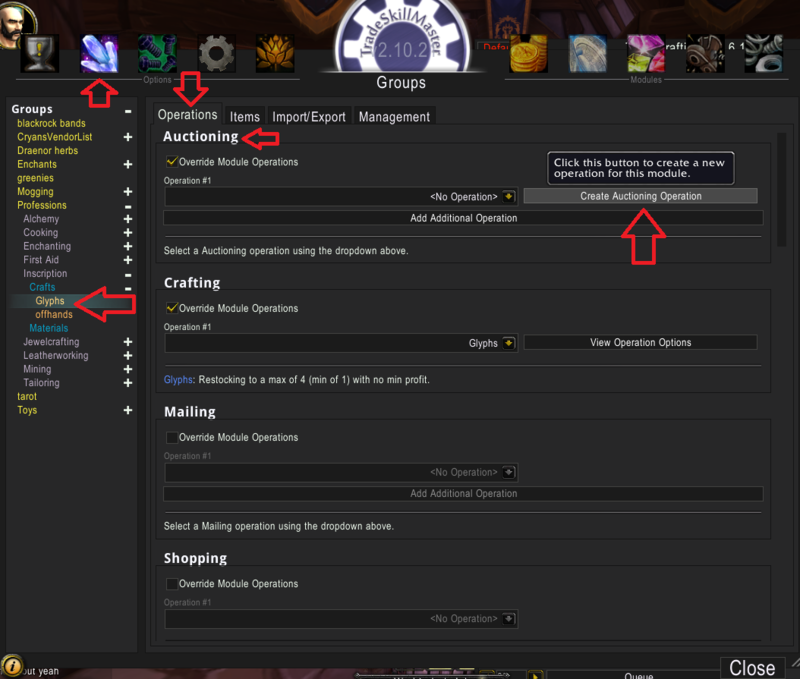 You will see on the left hand side that TSM has made a Group called Inscription and two Subgroups: Crafts and Materials. The Crafts (sub)group will have things like the glyphs in it, together with offhands and everything else a scribe can make. The Materials (sub)group will have all the things you need to craft the items – parchment and inks. We do not want to sell every single item that is craftable. So make a subgroup under ‘crafts’: call it Glyphs, click ‘switch to new group after creation’ and click okay to create the subgroup. Put “glyph” into the filter. (I’ve only blurred out my other groups so you don’t get confused by how many there are.) Press return, and they should highlight. 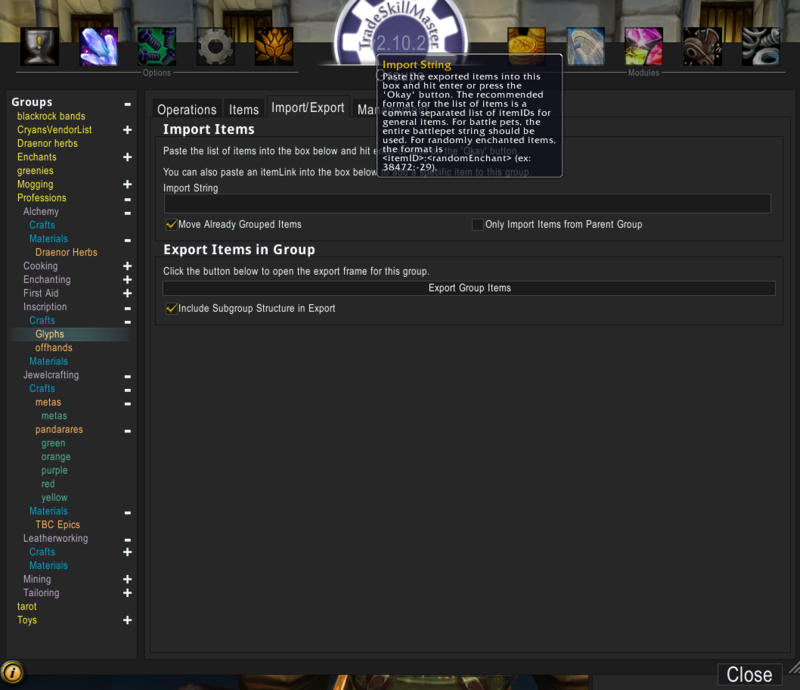 Then this will highlight everything with “glyph” in the name of the item. Unselect any Charred Glyphs. We don’t want to be craft or sell those! And they will move across from Parent/Ungrouped Items into the right hand Subgroup Items column. Congratulations! You now own a group called Glyphs which is subfiled under crafts, under inscription, under professions. 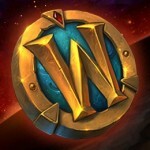 How Many Glyphs Should I craft? 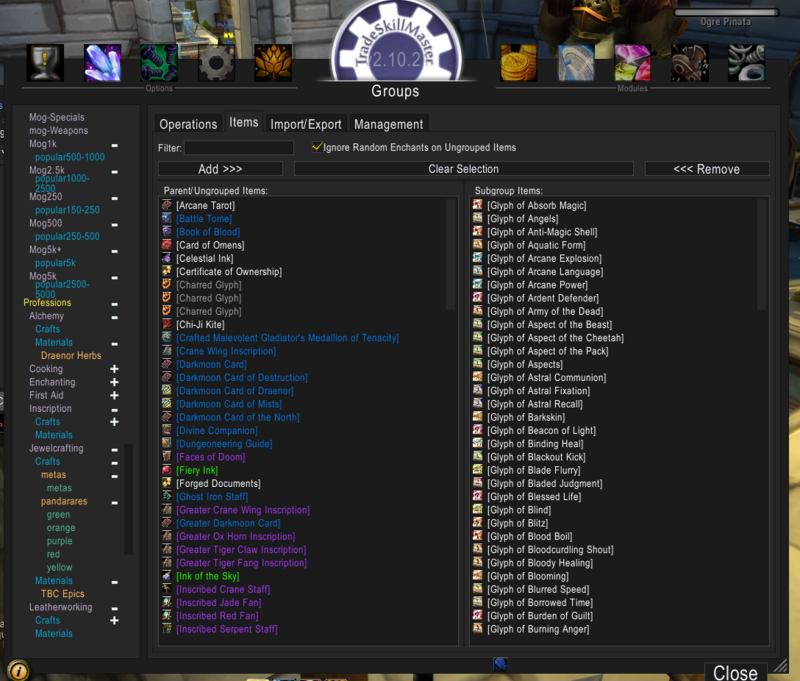 All glyphs go in the same TSM group. Glyphs are glyphs are glyphs. Some of them sell for more, some of them sell for less. The amount for which they sell, fluctuates. Glyph value have nothing to do with the materials. 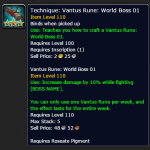 If you base the value of the glyph on what you crafted it from, it doesn’t make any sense. Herbs make every glyph, and the price for each glyph does not depend on the herb or ink from which it was made. 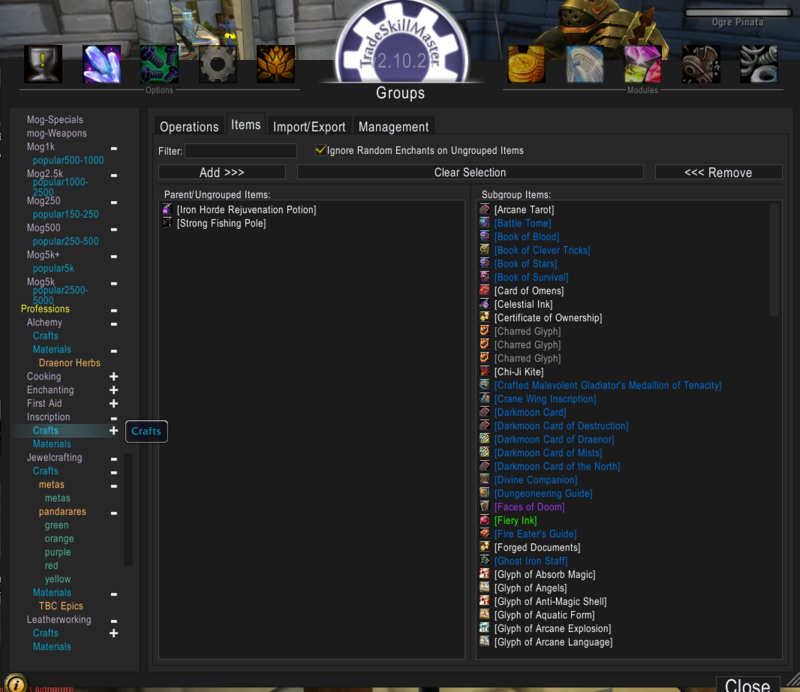 When you click on the Group “Glyphs” on the left hand side, a tooltip will tell you that there are no operations associated with the group. It’s time to remedy that! Just in case you don’t want to do it the easy way with TSM assisting you, you can also go to /TSM > Groups > Import/Export > Import String and cut and paste this string into the Import String text box. Keep “Move Already Grouped Items” ticked, and then press return. Once you have your group, its time to add some operations to it. Operations are tasks, rules, things that you command TSM do to the items in the group. The operations won’t work unless you attach them to the group. You can either create the operations separately and then attach them. Or you can make the operations as an extra to the group, pre-attached. We’re going the second route. We’re going to add Auctioning Operation. 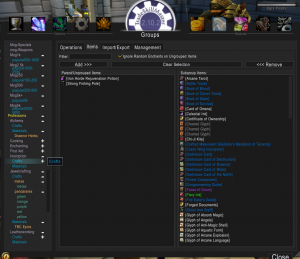 This task tells TSM to auction everything it can see from the associated group. 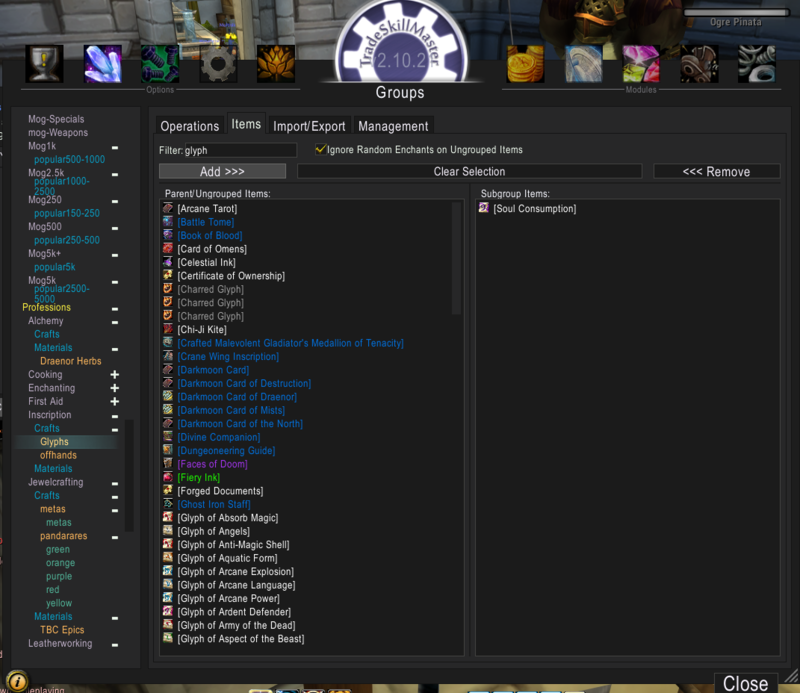 Under /TSM > Groups > Glyphs (the group you just made) find the Operations tab. Click View Operation Options if you want to edit them in the future. 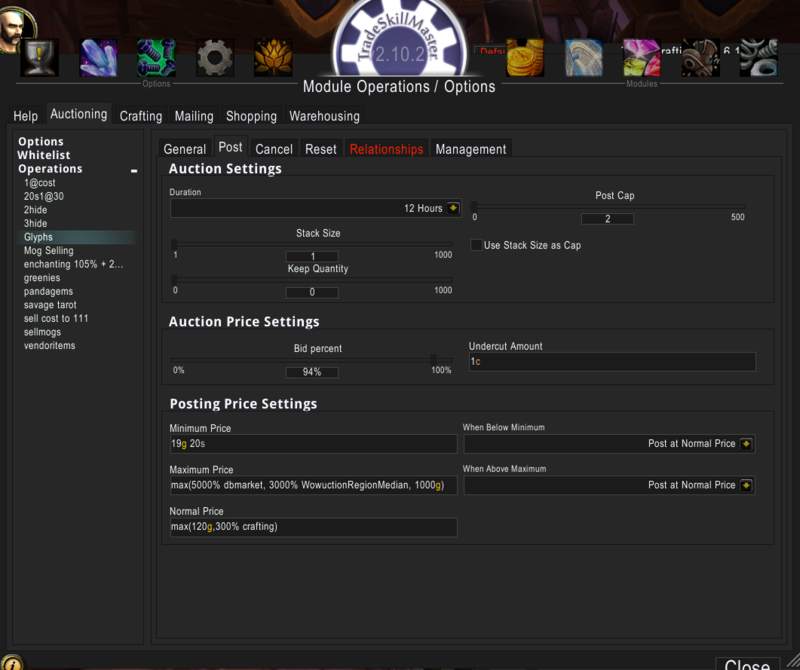 Go the Post tab and set your Auction Settings. These are the settings I’m using at the moment for posting. Like me, however, I expect you to experiment with changing these up and down as you attempt to find and then follow the changing and moving sweet spot for sales on your server. Instead of using complicated formula for the max and norm prices, you can put in an amount in gold, for example 500g and 150g. Bid % Set your bid cost to 100% to start, because no one bids on glyphs. If you want to give yourself the tiniest of edge, put your bid price at 99%. Your glyph will be listed at below the price of the same item with the same buyout price if it has a cheaper bid price. You’ll notice mine is at 94%, and that is simply because a competitor had set his bid at 95% and I wanted to have the edge on him. You won’t have this guy on your server, so start with 100% and move it only if necessary. 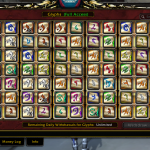 Post Cap: When you start, you should start with posting 1 of each glyph, and then increase it to 2 when you are feeling more comfortable and increasing the amount of stock you are holding in your guild bank. When Below Minimum: I always post mine at the Normal Price, which is the higher price that I would wish to sell the glyph. If I could reset the market, this is the price I would want to start at. Let me say it again because you may have missed it. 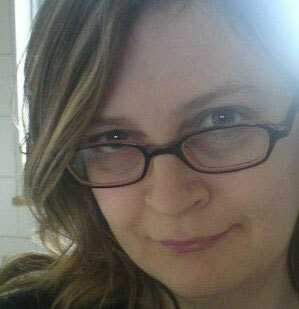 I expect you to experiment. My price settings will not work on your server. This is just a starting setting. You need to experiment and find your own sweet spot. 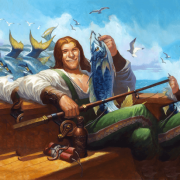 Crafting Cost: No minimum price, instead imagine a maximum at which price you will never pay more. 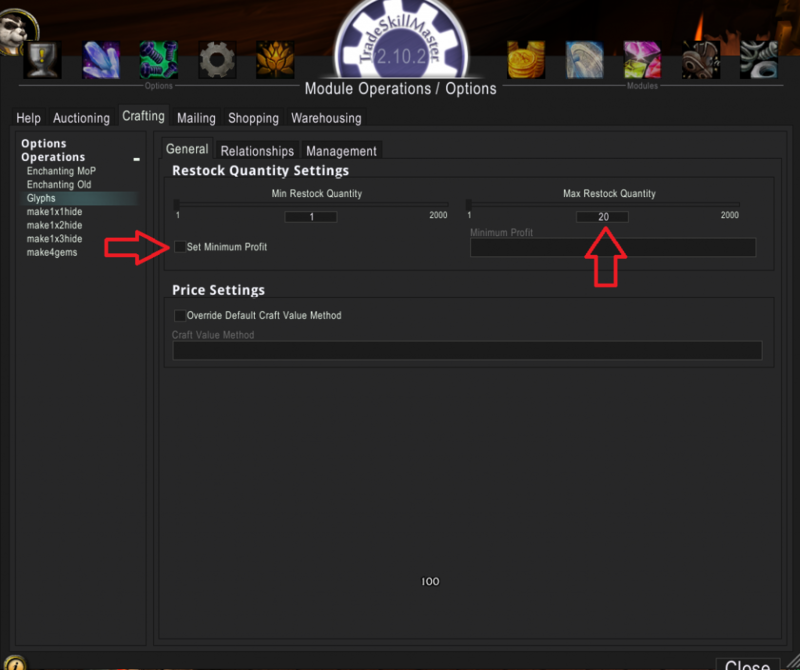 If herbs are selling for just over 1g each, then the amount “per ink item” you are looking for is less than about 5.85g. It’s easier to round up to 6g. 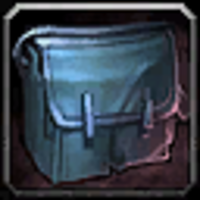 6g per ink makes 18g crafting cost per glyph. 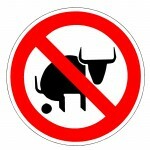 Therefore you can immediately know not to ever post a glyph for sale at under 18g. Naturally, you are going to aim to buy all herbs much cheaper than “6g per ink”. As long as you never go over your maximum, then you will never make a loss. 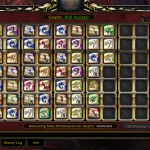 And if all glyphs are for sale at 20-200g, then they will all naturally make a profit. Most of your glyphs will either expire, or be undercut and you will cancel them in order to repost them. 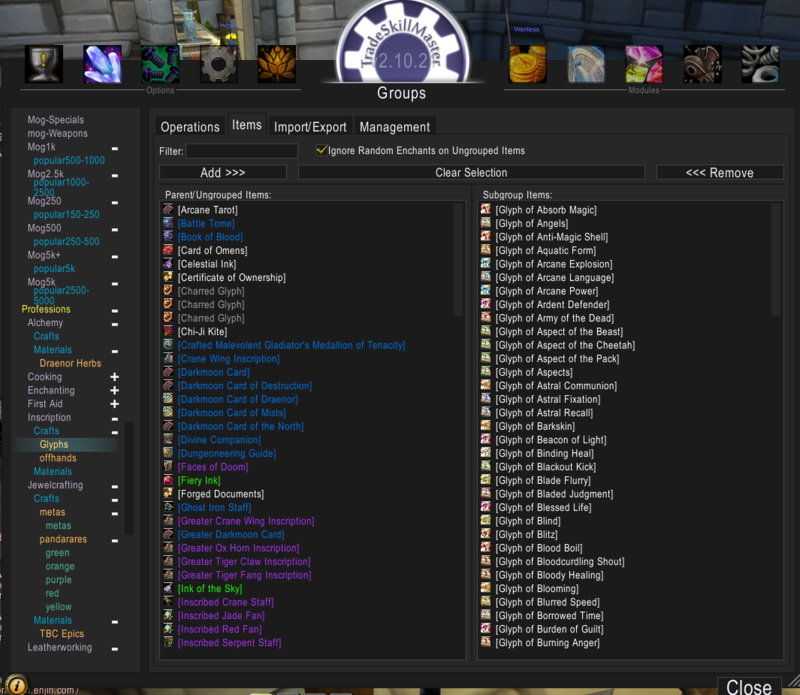 Our aim will be 20 of each glyph stored in the guild bank we purchased. 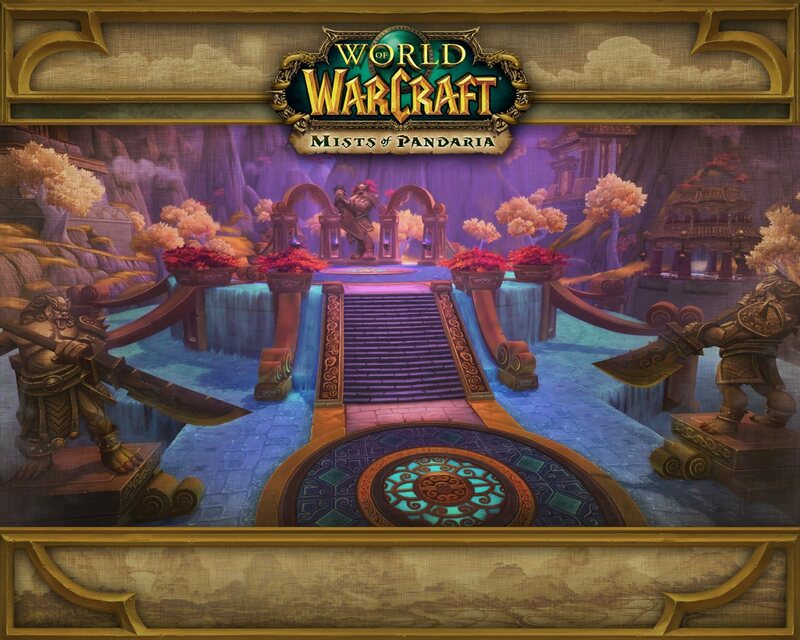 However, it’s obvious that the mats (the herbs) for every glyph are not free, and therefore we will start by aiming for 2 of each item (enough to fill the AH) then 3, enough for the AH and 1 spare for immediate restocking. Then we’ll increase 4..5.. until we have 20 of each glyph ready to go if and when the prices change. We’ll cover that a little later in the guide. 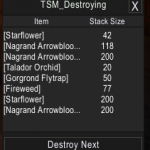 Once a single glyph sells, Trade Skill Master TSM will add up the number of that item, notice it we have less than the demanded quantity, and suggest we craft a replacing item. Why not make just the expensive glyphs? Why no Min Profit? Glyph prices are dependent on supply (of glyph) and demand (of glyph). It is not dependent on price of herb/s. When the glyph price fluctuates, and the cheap glyphs become (randomly, unexplained) expensive, you want to put the newly-expensive item up on the Auction House for sale. However, if you have not crafted any, if you do not have the stock, and you have only sold this item at its previously cheap price, you are now at the mercy of other Scribes who have stocked this item and are able to replenish the AH. 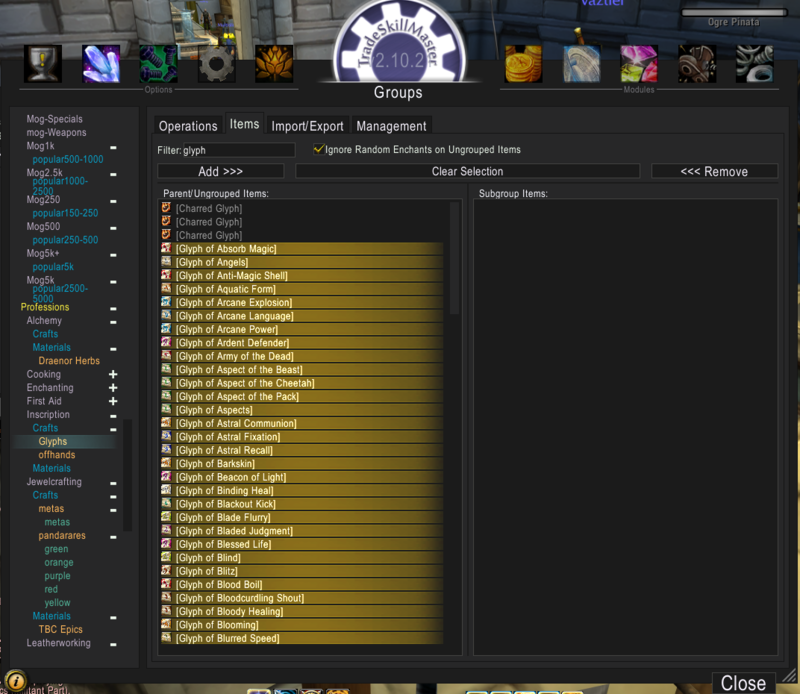 Its better to have a stack of every single glyph, and to replenish your stack, and have them pre-crafted, stocked in the bank, ready to post on the Auction House ready for when the glyph prices change. If the glyph prices stay so that item is always low, then extras will not sell, and you will never have to replenish and restock them. Once your stack of 20 is crafted and stored, you only need to worry about replenishing and restocking those that sell. You need to keep a good stock in your bank ready to sell when the market moves. 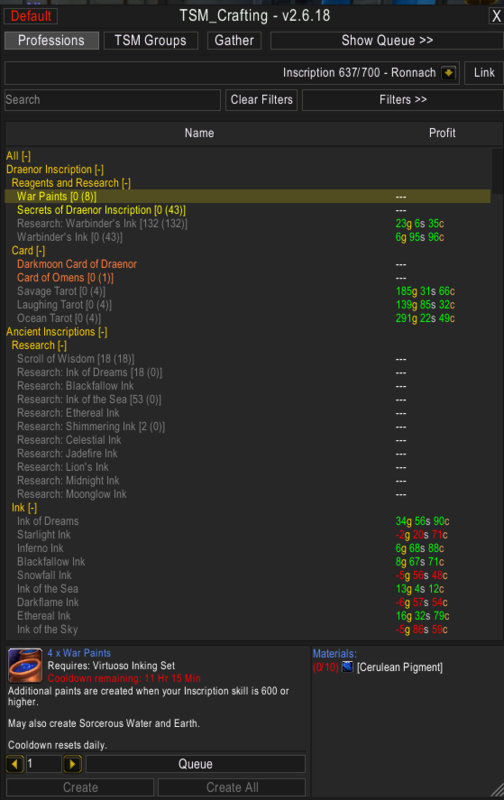 Pros: Glyphs that cost very little to craft and are worth no profit today can suddenly be worth a few hundred gold profit and you have a stock of them ready at all times. Ready to take advantage of market changes. Cons: It can cost a fortune, both in terms of gold for acquiring herbs, and in time in terms of milling those herbs. Unless you can source those herbs cheap or “free”, and mill them while you would normally be doing something else. You might be starting to worry that you are buying or acquiring herbs and not being able to sell the crafted glyphs immediately, however your stack of 20 glyphs will last you forever if you restock when glyphs sell. Did you make the TSM group and the operations? You did really well, this was the complicated part. Now it’s mostly just hard work! 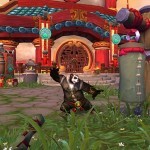 What do you do with the glyphs that are on the auction house for less than your minimum price? Do you leave them be, and still keep your minimum price the same, or do you add a shopping operation and buy them out? I ignore them. Either the price will go up, and TSM will start prodding me to craft and sell them. 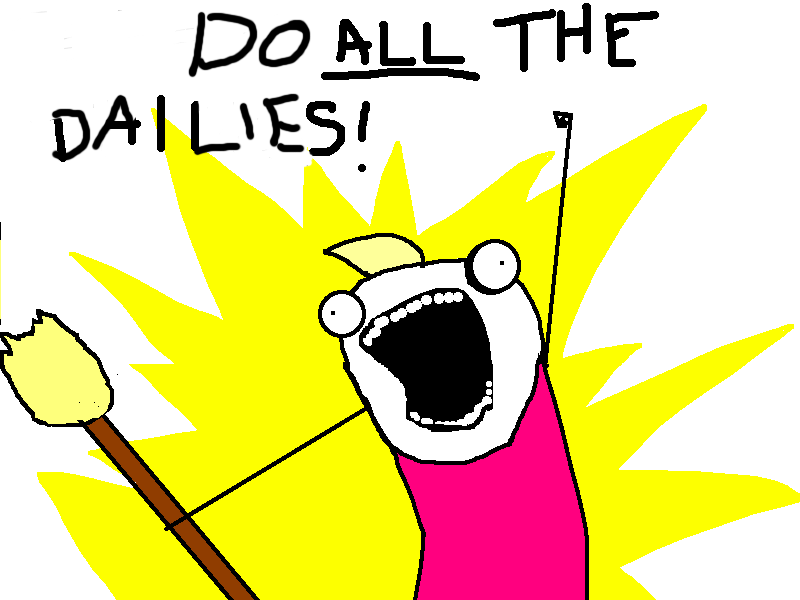 Or it will stay low, and remain useless and I won’t make any more glyphs. Not all prices can be manipulated. People just don’t want to buy some things. I had to reinstall TSM. 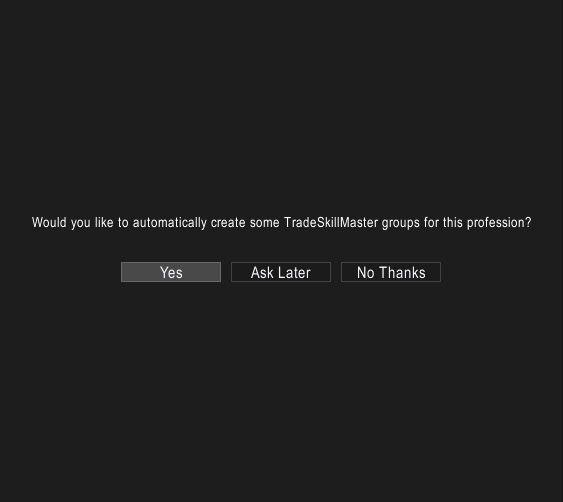 I went to set it back up but when I get to the part about adding operations by clicking the TSM Group button in the tradeskill window its blank. 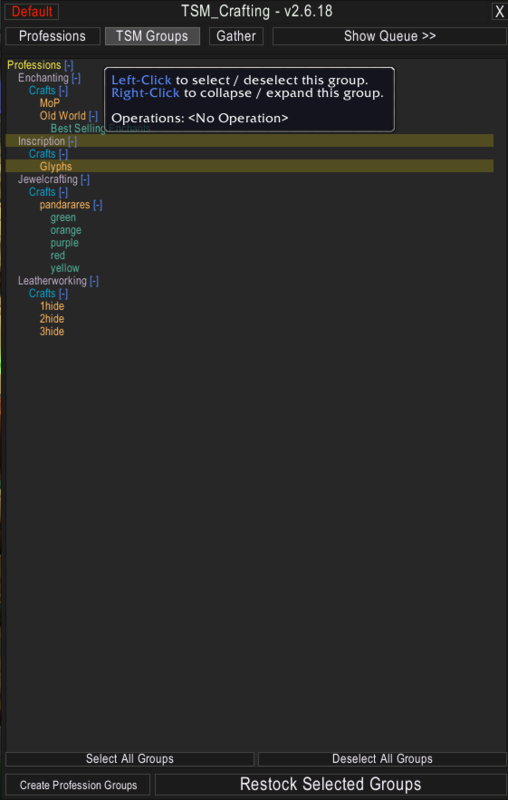 I tried deleting all the associated TSM .lua files and redoing it but it still doesnt work. It was working fine untili today when everything started messing up. 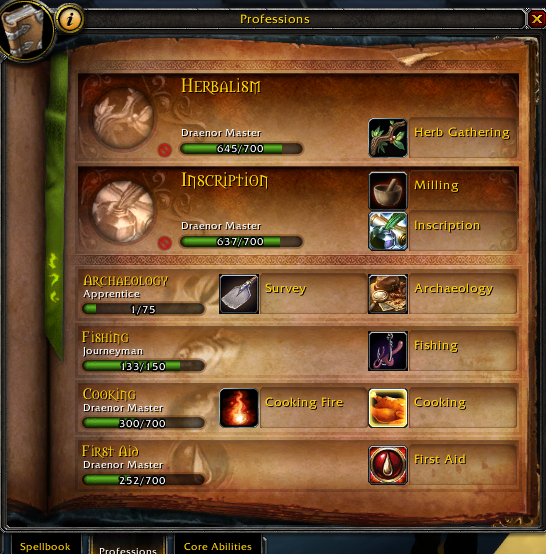 Just buy the cheap herbs, please don’t try and make one billion glyphs in one day. Take it nice and slow, we’re building an empire that will last for years, not a quick buck overnight.